(Photos courtesy of LPT Images) As the racing season winds down, every position and every point becomes more and more critical. As the points standings tighten, so does the racing and the emotions are at an all-time high. 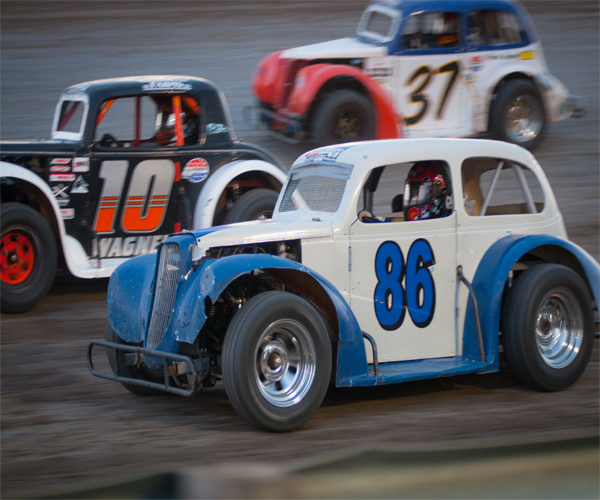 That was the case at the Dacotah Speedway on August 16th, as drivers and fans saw one roll over, two fires, three disqualified drivers and one fist fight in the pits. Only the top five would transfer to the feature in two, 10 lap shootout concy races. 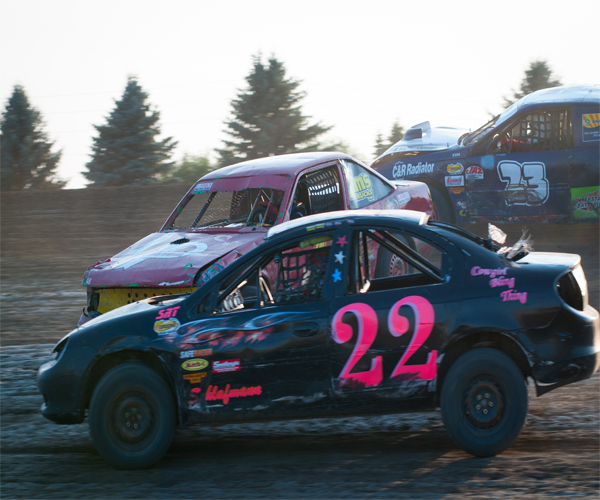 In the first IMCA Modified concy, Williston's Mike Hagen took the lead early. Randy Sandvick, who struggled in his heat race, quickly stormed through the field on the high side of the race track. Sandvick picked off positions quickly, passing Tracy Domagala, Geoff Hellman and Kody Schlopp before challenging Hagen for the lead. Sandvick took the lead with four laps to go but Hagen rallied back. As Sandvick and Hagen battled for the win, it allowed Schlopp to catch them and take it three wide for the lead. Domagala, who lurked in fourth, pounced at the end passing Hagen for third and Schlopp for second. On the final lap, Domagala got a run on Sandvick and as they raced to the checkered flag, Sandvick just narrowly edged Domagala for the concy win. Kody Schlopp of Estevan, SK finished third ahead of Hagen and Geoff Hellmen. 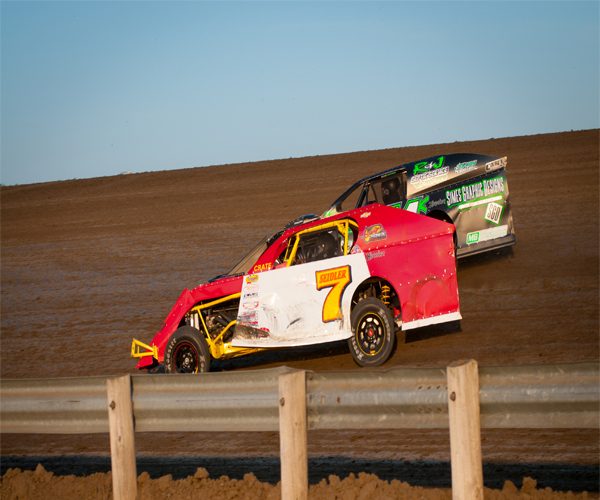 Travis Hagen and Donald Robinson battled for the lead early in the second IMCA Modified concy. The two drivers pulled away from the rest of the field but a caution for the spun car of Bryce Beck bought out a caution and regrouped the field with four laps to go. The racing continued under caution as Beck showed his displeasure with John Gartner Jr. by unnecessarily rubbing against Gartner Jr's car and cutting him off on the track. Beck was disqualified for rough driving and sent to the pits. Gartner Jr also took his car to the pits where an upset Beck waited for him. A small brawl ensued between the drivers and their pit crews. Officials and security broke up the fight and resumed the race. On the restart, Hagen pulled away as Robinson had to hold off a strong Travis Ulmer for second. As they crossed the finish line, Hagen won the concy by leading all 10 laps. Ulmer passed Robinson with two laps to go to finish second. Quentin Kinzley finished fourth and Travis Olheiser rounded out the top five. 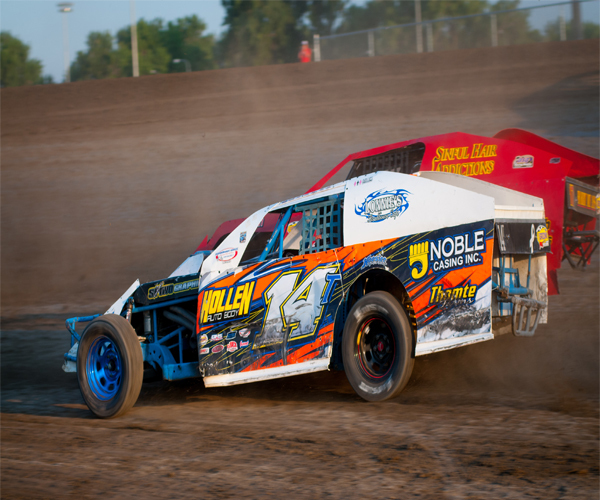 After winning his first career heat race at the Dacotah Speedway, Keith McCleary picked up where he left off in the Hobby Stock feature. However, McCleary had company up front as Jeremy Engelhardt and Scott Gartner were all over his back bumper and the three drivers went three wide for the lead. Gartner shuffled into the lead on lap three but Engelhardt took the lead away on lap four. Engelhardt and Gartner continued to battle for the lead until a caution on lap seven reset the field. Under caution, drama continued when second place Gartner choose to restart on the outside, following Dacotah Speedway restart rules. Third place Chad Hausauer also wanted to restart on the outside and shoved Gartner's car off the track, causing Gartner's car to stall under caution. Points leader Hausauer was disqualified and on the restart, Engelhardt pulled away as Ron Joern tried to hold off Jaren Wald of Napoleon for second place. Engelhardt led the final 11 laps to win back to back feature victories at the Dacotah Speedway. Jaren Wald finished second over Joern, Aaron Aaseth and Josh Roehrich. Outside pole sitter Jamie Schlafmann took the lead away from pole sitter Chance Seelye in the IMCA Sport Compact feature. Schlafmann pulled away leaving the rest of the field to battle for second. Points leader Derek Nitschke passed Seelye for second. Seelye then fell into the clutches of fourth place Josh Roehrich. Roehrich passed Seelye for third before a caution slowed the race with three laps to go. A caution couldn't slow Schlafmann down as she pulled away again on the restart and went on to win her fourth feature victory of the season. Points leader Nitschke crossed the finish line in second and Roehrich finished third. Seelye, running fourth spun off turn four coming to the checkered flag allowing Nic West and Cody Schulz to slip by and finish fourth and fifth. 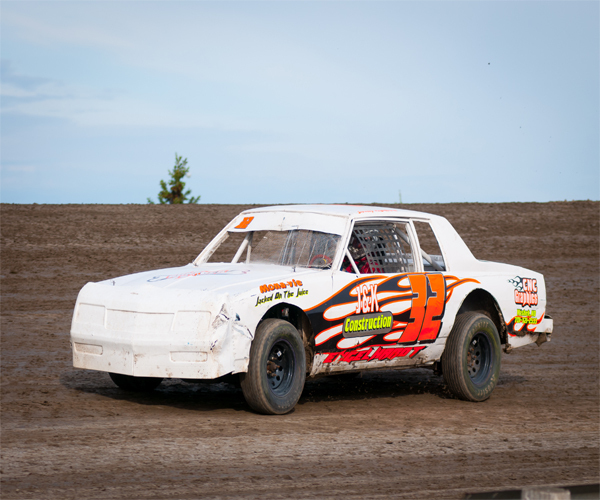 In 2012, Travis Ulmer had a career best season at the Dacotah Speedway but in 2013, he has struggled from week to week. 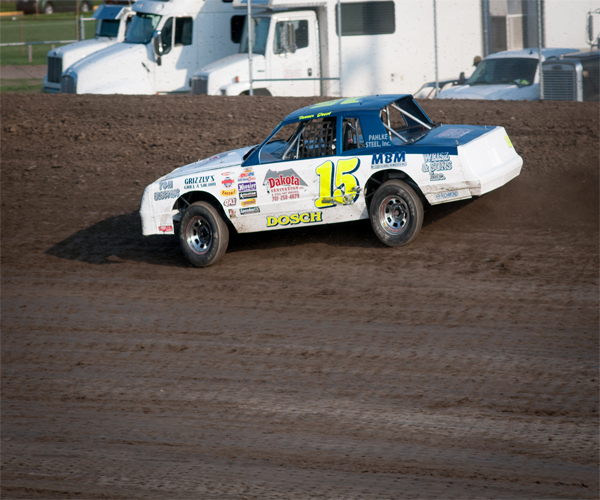 It looked like luck was finally on his side in the WISSOTA Street Stock feature as he pulled away early in th e race. However, when a big wreck collected drivers like Tanner Dosch, Eric Harpole, Mike Miller and several others on lap five, his luck quickly went away as the caution flag waved. On the restart, Zach Frederick quickly took the lead away from Ulmer but Ulmer rallied back. They continued to race for the lead which allowed third place Jeremy Schmidt to catch them. Schmidt caught Ulmer and passed him with eight laps to go. As Ulmer tried to hold off Brad Kadrmas, Allen Frederick and Geoff Hellmen, he over drove turn four and got off track, losing all his track position. A caution with four laps to go, regrouped the field. On the restart, second place Jeremy Schmidt misjudged the restart which jumbled up the field behind him. Tanner Dosch, who restarted last on the lap five restart, got a great restart and took it three wide with Hellmen and Zach Frederick for the lead. Using the high line, Dosch bursted into the lead as Frederick and Hellman battled for second. Dosch led the final three laps to win his first feature of the season. Hellman passed Zach Frederick for second while Allen Frederick finished fourth and Brad Kadrmas finished fifth. Troy Hoff of Flasher took the early lead in the INEX Legend feature. A red flag halted the race briefly when Preston Martin's car started on fire. On the restart, Steven Kuntz battled with Hoff for the lead. They raced side by side until Kuntz took the lead on lap six until debris on the track brought out the caution with eight laps to go. Kuntz's low line around the Dacotah Speedway prevailed on the restart as he started pull away from the side by side cars of Troy Hoff and Tom Wagner. Despite battling for second, Hoff and Wagner closed in on leader Kuntz. As the white flag waved, Kuntz and Hoff were door to door for the win while Wagner lurked close behind in third. Coming out of turn four and to the checkered flag, Hoff's high line gave him the momentum to edge Kuntz at the finish line for his first ever career win at the Dacotah Speedway. Points leader Donavin Wiest passed Wagner for third and Drew Papke rounded out the top five. In the final feature of the night, Paul Schulz and Shawn Anderson started on the front row of the IMCA Modified feature. Anderson took the lead from Schulz who quickly fell to seventh. Anderson started to pull away from the field as Marlyn Seidler and Mark Dahl battled hard for second. As they raced side by side, they slowly caught leader Anderson. It was a three car battle for the lead as Shawn Strand lurked in fourth. Seidler shuffled into the lead on lap eight as Dahl passed Anderson for second. As Seidler negotiated lapped traffic, Dahl had to hold off a hard charging Shawn Strand. When Strand struggled to get by Dahl, it allowed Jeremy Keller to close in. A series of late race cautions were the last thing Seidler wanted to see but on the final restart with two laps to go. However, Seidler pulled away with ease and won his first feature of the season. Jeremy Keller finished second ahead of Strand, Dahl and Hank Berry.